If turning 60 this year has given me more creativity in learning how to focus on today, then being 60 is a great thing this year! The question I have to ask myself though is, "Why did it take so long?" I've always lived life as an adventure, but my mind has been more on the future of things since I'm so administrative and task-oriented. Having to find 60 new things to experience this year has made me focus on the 'now' in many ways since I am always looking for something new to see or do. Of course, I still make plans for the future, and some of them are to fulfill my goal of 60 new things in my 60th year (it begins with that link), but more than anything, it's really made me pay attention to the details of each day! It's a feel good way to live, I think! #21 of 60 - This beautiful Silvery Checker Butterfly was one that I had never seen, but I wasn't sure on the identification of it either since there are a lot of checkerspots that look very similar. 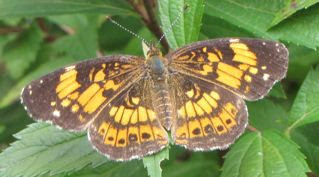 I'm grateful for the online environment of places that can help out with such things, such as the Butterflies and Moths of North America website. When ever you want to get an ID of a butterfly or moth, be sure you make note of the plant it may be laying eggs on a host plant making it easier for somebody to identify the species. Of course, date and time are important also, but your camera records those. New butterfly species have been a big part of my 60 new adventures and I thought about how appropriate that is since I feel passing into the 60's realm is a bit like shedding the chrysalis of the past to emerge yet again, a new creature, always being made new by my Lord Jesus Christ. #22 of 60 - If you've read about the Eastern Gray Tree Frog that laid her eggs in our birdbath, you'll know that I released a bunch of those tadpoles into the pond with great concern about our large Green Frogs making meals out of them. 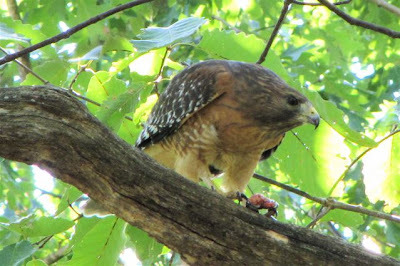 Well, September 21, a Red-shouldered Hawk swooped down while I was on the porch and grabbed something from the ground. Since birds flew in every direction and squirrels scrambled up trees shouting warning calls, I didn't know what it had caught, but the unique flutter of our Mourning Doves' wings sure had me concerned that he had taken one of our beloved doves - they mate for life you know. Since he flew to a nearby tree and with my camera beside me, I decided to try to get photos to see if I could tell what he took. While taking the photos, I didn't know what he had. I always use the viewfinder rather than the flip-out screen. After downloading and zooming in, I saw it was the largest of our Green Frogs. I was heartbroken at losing any member of our backyard wildlife habitat, but I could focus on the good of it for the tadpole babies I had released two days before. I'm told I took a good video of the hawk, but I've not been able to view it all the way for obvious reasons. #23 of 60 - Many years back we moved many of the plants we had in the garden to our deck because the deer were eating them before we had a chance to see them bloom. 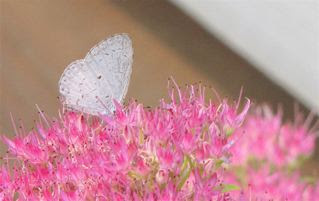 Our Stonecrop Sedum was one of them and those plants have attracted so many butterflies, including the Summer Azure Butterfly I saw on September 24. This butterfly is a nectar drinking one so it's having breakfast in this photo. I always thought all butterflies drank nectar until I rescued one from the ground at a gas station and took it home only to find out it wouldn't drink from the flowers that I placed it on. I ran for my butterfly book and identified it and read that the adult food source was dung and rotten fruit. I quickly mashed a bit of banana with water and even dropped in a bit of squirrel poop, and then put it before him to find him quickly insert his probiscis into the mess for an extended time of feeding. 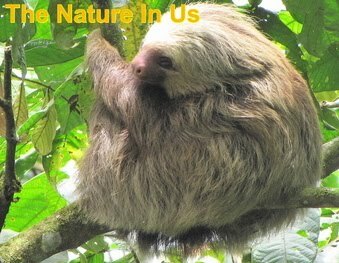 I learn bit by bit about God's Creation as I simply look at what's going on around me. #24 of 60 - You know how it is surfing online, you click from one website into another and have no idea how you ended up where you did. This is what happened one day when I discovered a website about an event that was scheduled for October 1-2. They called it, "The Gathering" and the speaker was Wade Taylor. Neither my husband nor I had ever heard of him, but my spirit compelled me to ask if we were to attend this gathering that would be only 2-1/2 hours from us. I see spiritual events now and then with speakers we know, but most times when we pray about attending we do not feel led to go. This time we both felt it was where we were supposed to be. The focus was for those who were eagerly seeking more of God. Well, that certainly fits where we are for over a year now. We were blessed deeply with those two days of teaching and the worship times. Wade is somebody that speaks with power and the words seem to sink deep into your spirit promising hours of pondering time for the revelations voiced. 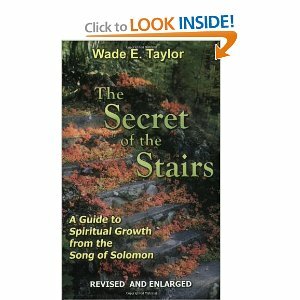 This man has an obvious close walk with the Lord and before leaving I discovered a friend of mine knew of him and recommended one of his two books, The Secret of the Stairs, which we purchased while at the event. In it he shares a lot of insight on spiritual maturity and intimate communion with the Lord. It was a book I could take only small morsels from each morning to chew richly on it until the next day and some days I would simply repeat the few pages that I'd read the day before. The wisdom he shares has profoundly changed both of our lives and especially our understanding of God's message to us in the Song of Solomon. What a great adventure this was for us! #25 of 60 - Wade mentioned daily communion (Lord's Supper) with our Lord, mentioning that in the process of it, we choose to detach ourselves from the tree of knowledge and attach ourselves to the tree of life. Jesus said that He is the “vine” (Tree of Life), and that we, as being a branch, only have life as we partake of His life. Through Adam’s transgression, we were removed from our “connection” to the tree of life, and became attached to the tree of knowledge. There can be healing in it both spiritually and physically. 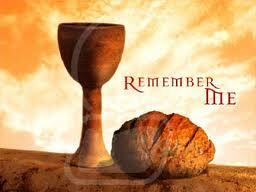 Often the practice of communion becomes a ritual on a given day each month at church with some churches not even following the commands associated with it . Randal and I wanted more than that so we have chosen to have daily communion with the Lord, individually, during our morning time with God. It's been a tremendous blessing to our souls and certainly a great adventure for my spirit. Read more about Wade's teaching on communion. My journey of adventure continues here with the next post making me half way through my 60 new experiences this year.